Continuous scrolling data sets are a common mechanism seen in news feeds sites such as Twitter and Facebook. As you scroll down the page and reach the bottom more results are loaded dynamically as needed. 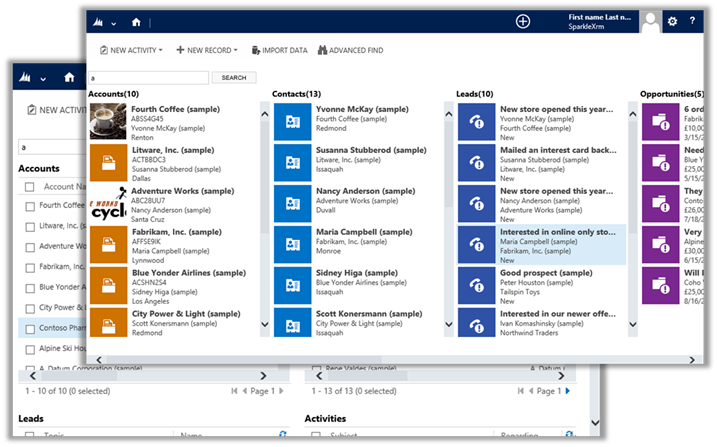 Dynamics CRM has traditionally shown paged datasets and although this is mostly still true we are seeing some areas shifting to a more continuously such as the Tablet App and Social Feeds (although the news feed does required your to select 'More'). With this in mind I decided to implement a continuous scrolling Data View for SparkleXRM. The original Multi Entity Search sample used the standard EntityDataViewModel but I've now added VirtualPagedEntityDataViewModel to the sample project which shows how this virtual paging can be accomplished. Under the covers it is stilling paging using the fechxml paging cookie but as the user scrolls, additional pages are retrieved in order to show them. Once the pages are loaded, they are cached in the same way that the EntityDataViewModel did. I have also added support for showing the entity image next to the record so the end result is very similar to the Tablet app search results. Infact the entities that are shown are read from the same Tablet search configuration. Both the paged and continuous scrolling multi entity searches in in the solution but only the continuous scrolling version is added to the ribbon button. I'll be rolling a version of the VirtualPagedEntityDataViewModel into the code SparkleXRM soon – so let me know if you have any particular uses for it in mind.